Another instalment in my photos from ten years ago series – this time it is February 2008. For something completely different, was start with something else I enjoy photographing – aircraft. 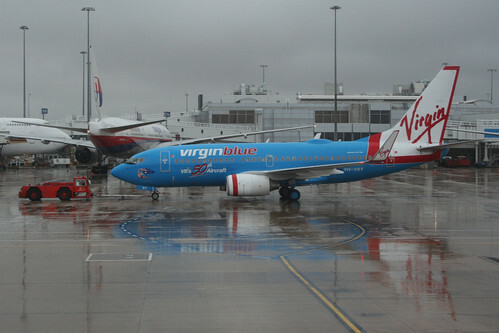 At Melbourne Airport I spotted something different – a blue painted Virgin Blue jet. A decade ago Virgin Australia was called Virgin Blue and painted their aircraft red, but 737-700 VH-VBY was the sole exception – painted blue in 2005 to celebrate their 50th aircraft, remaining in the scheme until the 2012 Virgin Australia rebranding. 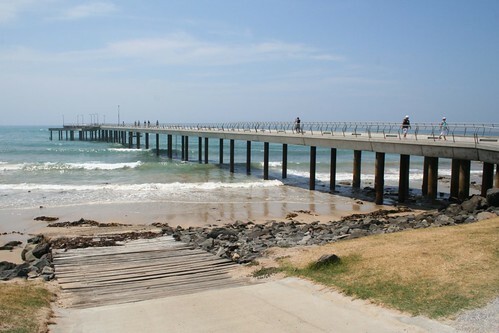 I also visited the seaside town of Lorne, where a new pier had opened a few months before. 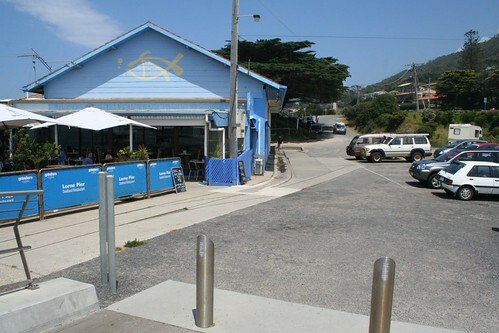 You might think Lorne is the last place where you might find railway tracks, but I found some – running between the pier and the Lorne Fisheries Co-op. Originally used to transport trolley loads of fish, they now lay idle, with the historic crane from the pier stored alongside, awaiting a new life. 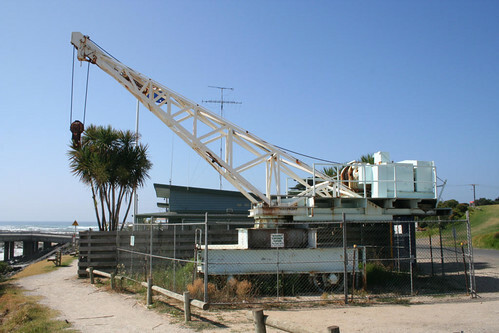 But it was to come to nothing – in November 2009 the crane was cut up for scrap. Also at Lorne I found a V/Line road coach repainted in what was then the latest version of their livery. While back in Geelong I found a piece of V/Line history – an orange sign from the 1980s, that still looked fresh. 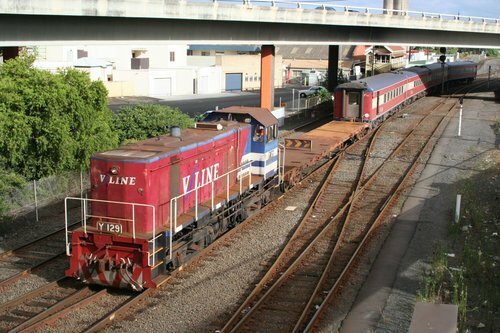 But other V/Line trains were also starting to show their age, like this one headed through the train wash at Geelong station. 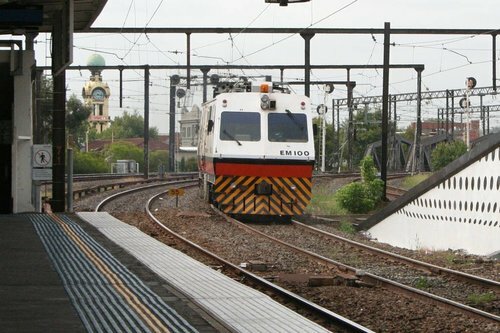 Up in Melbourne I paid a visit to East Richmond, where I photographed a Connex liveried X’Trapolis pulling into the station, the Dimmeys clocktower in the background. Metro Trains Melbourne replaced Connex a few years later and the clocktower is now hidden behind apartments, but the train itself is still in service, with new X’Trapolis trains rolling off the production line every month. Around the corner I was lucky enough to capture track inspection vehicle EM100 out and about. Used to inspect the tracks for faults, the vehicle has since been repainted in Metro Trains livery and renumbered IEV100, but is still used in in that role today. 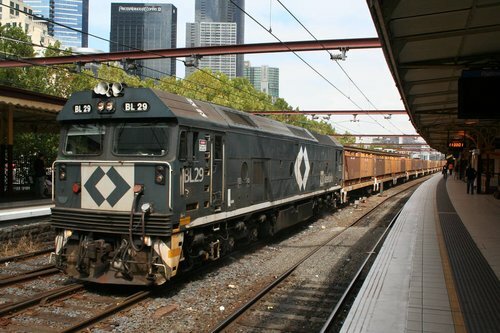 At nearby Flinders Street Station I captured a freight train, conveying containers of coil steel to the Bluescope Steel plant at Hastings. 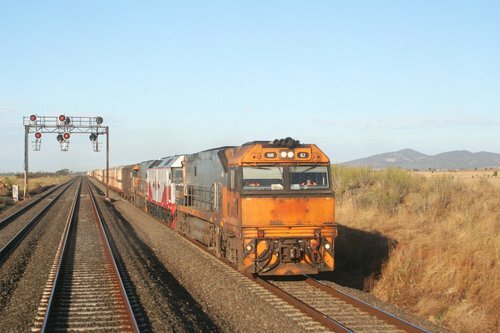 Other than the colour scheme of the locomotives up front this service has changed little in the years since – unlike other sources of coil steel traffic that have been lost to road transport. 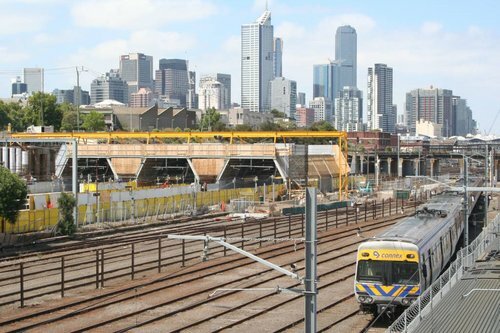 On the other side of the city, I visited North Melbourne Station, where work had started on a new concourse at the city end of the platforms. The skyline is a shadow of what is seen today – low rise warehouses dominated the area, with no sign of the apartment blocks that now dominate. 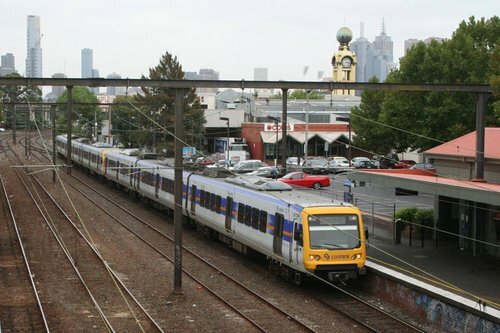 A decade ago train services to Melbourne’s west were stuck in the past – the explosion in rail patronage had only just started, and ‘half sized’ 3-car trains still the norm on off-peak Werribee line services. 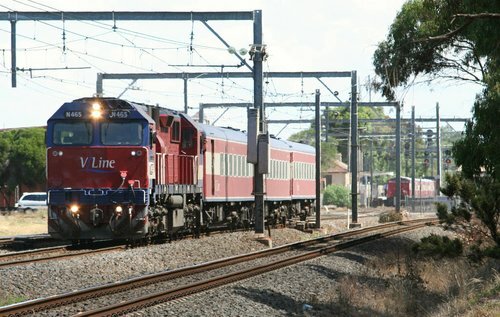 The same could be said about Geelong line trains, with 3-car long locomotive hauled trains common during off peak, complete with an almost empty first class carriage and locked up snack bar. These trains made trainspotting on my commute easy. 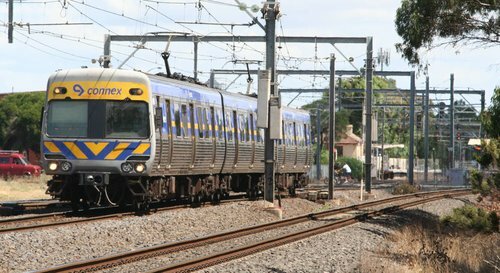 But today seeing any form of locomotive hauled train at Werribee station is a rare occurrence – since 2015 V/Line services to Geelong use the Regional Rail Link tracks through Wyndham Vale and Tarneit, and VLocity trains now dominating the fleet. Left field but fascinating infrastructure history as usual. Not so long ago but such huge change typified by the skyline vista. You certainly get around. I need to notice the diffetent trains more! The changes to the skyline happen so slowly, it takes looking at old photos to see how much it has really grown.